Because Zeus was born here, Crete is often referred to as a divine island. The contrasting landscape with its important cultural treasures is perfect to discover with a rental car. The Mediterranean flair of Greece and last but not least the hospitality of the people make Crete an incomparable holiday destination. The extensively endemic flora contains an abundance of unknown and well-known flowers and herbs. Crete exerts an unbroken fascination not only on historically experienced visitors. Benefit from the price comparison on Driveboo and find the cheapest car rental offers. The island of Crete with its 8,261 square kilometers is the largest island of Greece. In the ranking of the Mediterranean islands, Crete ranks 5th in terms of area. With seventy-nine inhabitants per square kilometre, Crete is comparatively sparsely populated. About 174,000 people live in the capital Heraklion. Due to the low population density as well as the wild and lonely landscapes, a rental car is indispensable for the comprehensive discovery of Crete. 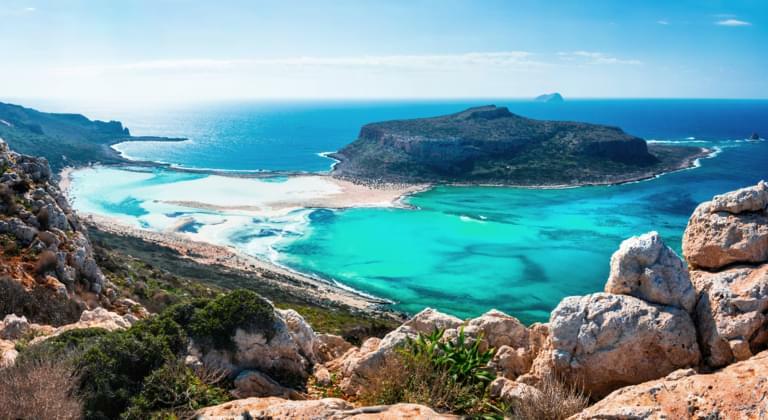 In terms of landscape, Crete offers a great contrast between the Mediterranean sandy beaches and the rugged, snow-capped peaks of the three mountain ranges. In the Ida - mountains in the middle of the island lies Psiloritis, with 2456 meters the highest mountain of Crete. In the white mountains in the west, called Lefka Ori, lies the Pachnes with a height of 2445 meters. The third highest peak is the Dikti with a height of 2148 meters on the Lasithi plateau in the east of Crete. To explore the 1020 km long coast of Crete by rental car theoretically requires about 15 hours of driving. The distance from east to west is about 250 km as the crow flies. The distance from north to south on the wasp waist near Ierapetra, the narrowest part of Crete, is 14 km. Crete's best transport infrastructure can be found on the north side of the island, where a well-developed motorway connects Kissamos in the west via Heraklion with Agios Nikolaos in the east. Along the route there are the most beautiful towns and the most important sights of Crete. Starting from Agios Nikolaos in the east, the enchanting city of Rethymno in the middle and the oriental-looking Hania in the west, Crete can be explored with a rental car. The tourists arriving in Crete by plane land at one of the two island airports in Chania or Heraklion. It does not matter in which city you arrive or where you rent a car, as the distances between the two destinations are manageable. During the approach to Heraklion Airport you get a first impression of the landscape and of course of Heraklion itself. The view through the airplane window falls on hilly stretches of land with breathtaking mountain ranges, meadows and fields as well as white sandy beaches where the waves of the Mediterranean break. The international airports in Chania or Heraklion have retained the individual charm of a small airport, which allows you to quickly locate the rented car. If you leave the metropolises of Heraklion or Chania, the traffic calms down and you get used to driving on Crete in a short time. Already after the first few kilometers on the motorway, the Cretan tranquillity is noticeable, allowing enthusiastic views of the magnificent landscape on the way. With the rental car, the first day of your holiday in Greece is already a wonderful combination of pure relaxation and a great experience. Only fifty kilometres from Heraklion lies the 12,000 inhabitants - the city of Agios Nikolaos in Mirabello Bay. The former fishing village has developed over the years into the lively capital of the Lassithi prefecture and has a long tradition in the hotel industry. In ancient times, Agios Nikolaos was the harbour for the city of Lato, whose remains can be explored about five kilometres inland with a rental car. 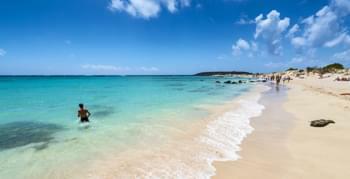 Numerous sandy beaches in the surrounding area allow relaxed sunbathing and relaxation. Worth seeing is the island of Spinalónga in front of Eloúnda, whose various jetties are easily accessible by rental car. Venetians and Turkish occupiers left behind impressive buildings during the course of history, before a leprosy ward was operated on the island until 1957. A detour to Gournia, the only completely uncovered Minoan city, is particularly worthwhile. Farther to the east is the easternmost city of Crete, the town of Sitía, with its 8,000 inhabitants and particularly beautifully situated. In the surrounding green oasis, the fruits for the high quality olive oil from Sitía grow as well as the famous Cretan wine. In order to experience Crete comprehensively, one cannot avoid an excursion on the plateau of Lassithi. Starting from the motorway, the road with numerous hairpin bends spirals up until it reaches the Ambrélos pass. At an altitude of about nine hundred meters, the trail leads past dilapidated windmills and affords a magnificent view of the coastline between Heraklion and eastern Crete. The pass height of Ambrélos is also the entrance gate to the Lassithi plateau. At an average altitude of eight hundred meters, two thousand metres high snow-covered mountains frame green fields and orchards. When circumnavigating the six by nine kilometers plain, special attention should be paid to the village of Psichró, which seems inconspicuous at first glance. If you follow the narrow connecting road with your rental car, you will reach a cave of epochal importance: the birth cave of Zeus! Romantic with oriental flair of bygone times, the nightlife in the city of Rethymno enchants with the Fortezza, the mighty fortress. But also during the day you can enjoy the magic of the small shops while strolling through the narrow lanes. In the west of Georgioupolis, pelicans can occasionally be observed at close range while bathing in the freshwater river. From Rethymno many roads lead to the hinterland, whose fascination can be easily and conveniently developed, especially for rental cars. To the west of Chania the motorway ends, the settlement becomes thinner and the landscape is more pleasant. Even here you can find traces of long gone cities. Excavations in the ancient port city of Phalasarna await visitors on a trip to the lonely west of Crete. While the people in front of Knossos are often queuing up in line, in Phalasarna you are usually alone in the remains of the ancient port, which is situated a little inland. The formerly closed artificial war harbour was carved out of the coastal rock. In the 4th century AD, after tectonic activities, the ground rose. Later, the port city, which no longer had an economic basis after the earthquake, was simply abandoned. If you travel directly south from Chania by rental car, you will not only be rewarded with the spectacular landscape. On the south coast, Europe's longest gorge, the Samaria gorge, with its 18 kilometers, attracts hikers from all over the world. The smaller but no less impressive Imbros gorge in the neighbourhood is easier to walk. A Caribbean dream of unique beauty with a meditative atmosphere is located in the solitary southwest of Crete. At the end of the road is the overwhelming beach of Elafonissi. Through the knee-deep water of the lagoon you wade to the island of Elafonissi. The island with its pink sand and the dream beach have been protected since 2000. Without renting a car, the highlights of Crete are difficult or impossible to reach. You can book your car hire in Crete and Heraklion at a low price by using the price comparison on Driveboo. This is the best way to get the best deal on your car rental in Crete and Heraklion. We wish you a good rental car ride and a nice holiday.